AJ Leitch-Smith, right, in action for Yeovil against Fleetwood. Morecambe boss Jim Bentley has revealed the identity of the striker he missed out on. Former Yeovil and Crewe front man AJ Leitch-Smith turned down a move to the Shrimps last Friday, instead putting pen to paper with League 1 Port Vale. Bentley is on the hunt for a forward to fill the void left by Jack Redshaw’s move to Blackpool. The Shrimps boss said: “It’s a little bit frustrating. “We offered AJ Leitch-Smith a deal and had a good chat with him but he’s opted to stay in League 1 with a club near to where he lives in Port Vale. “He’d recently been released by Yeovil and we were unlucky there. Bentley wants someone with experience of League 2 and preferably, League 1, with Paul Mullin and first year professional Jack Kelleher the only out and out strikers on the books. He said: “Someone who’s got a little bit of experience at this level and even the level above would be ideal. “But they are hard to come by. Everyone wants a forward, everyone wants a 15 or 20 goal a season man and they are out there but people are snapping them up. “There were a couple of targets I would have taken to replace Jack earlier in the summer but the timing meant they’d already moved on. 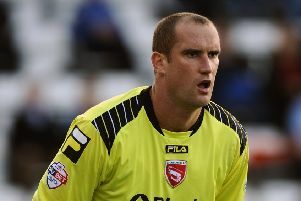 Trialists Luke Pritchard, a winger formerly of Preston North End, and Tony Thompson, a goalkeeper previously with Rotherham, remain with the club. Kevin Ellison’s brother Ryan trained with the club for the opening two weeks of pre-season in his bid to regain fitness after a serious injury at Oldham but has now left. Bentley said: “We’ve got Luke Pritchard and Tony Thompson that we’re running the rule over. “They’ll play a full game away at Carnforth (on Monday night) so we have can have a good luck at them.